I finally have some free crochet time on my hands now that I finished my girls fall sweaters. I had to rip it out and start over twice! All the while these little shoes were tickling my brain saying "make me!" 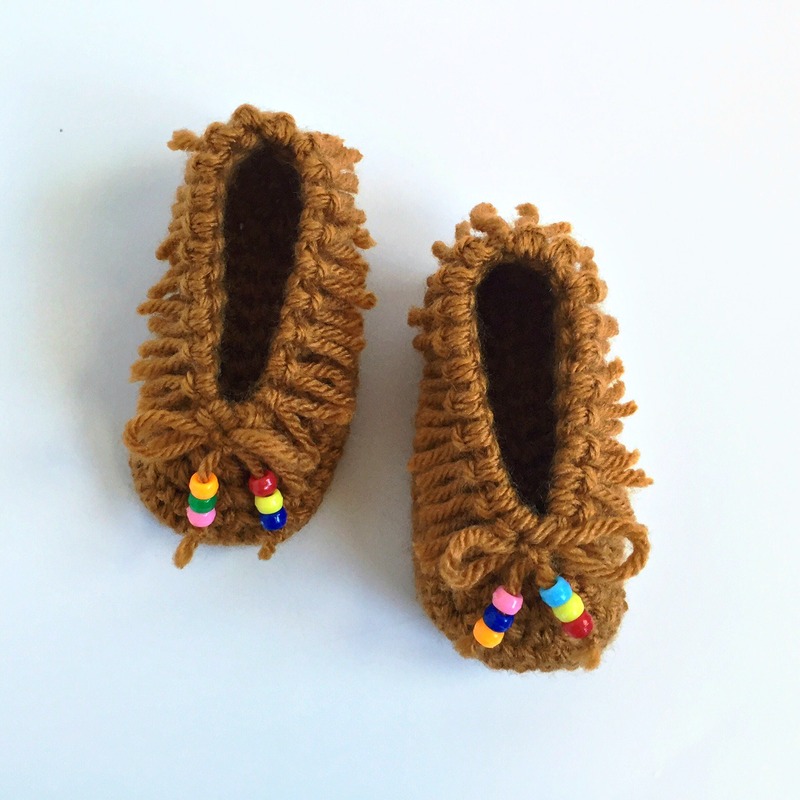 Well, here they are... the cutest little moccasins ever! 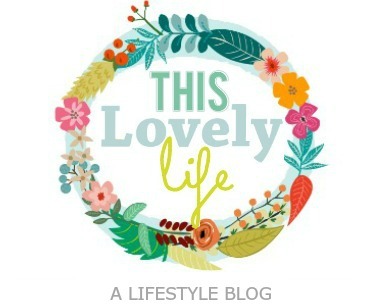 Here is the free pattern, enjoy! This pattern is for size 3 months. To make them smaller, go down a hook size. To make them larger, go up a hook size. This pattern is worked in the round. No chaining and no turning. Wrap yarn around your flattened hand many times. Cut one edge, this will leave you with a bunch of strands. Insert hook from outside pointing in through the top stitches, and pull through a loop. Put cut ends through loop and pull tight. For security, place a drop of super glue on the backside of your fringe. You wont see it or feel it but it will keep the fringe from coming undone. After you finish all the fringe, give it a 1" hair cut. Cut a long length of yarn and tie a bow around the very front sc column. Knot it three times. String beads and tie each end off with three knots on top of each other to keep the beads from being pulled off. You can also use your superglue on the knot as well. Voila! Please pardon my awful photography... a new camera is on my Christmas list! These are so sweet. Thank you for the pattern and tutorial. Darlene P.
Your welcome! Glad you enjoyed making them! I look forward to a day where I can sit down and make a couple pair of these for expected arrivals. I started making these and got done with the sole part, but they seem really big for a 3 month old. The soles were bigger than my 7 month old's feet and she has big feet. Hi! Im not sure why that is happening, check to see if you are adding an extra sc row after round 6. Maybe that is the problem? If you haven't resolved this problem, use a smaller hook. I made one with a G since I couldn't find my H hook, and it seemed huge, like maybe for a one year old. I went down to a D and it seems appropriate to a newborn size, so maybe an F would be more suited to a 3 month size. Everyone has a different tension and never considered mine to be loose at all, but doing this in a G hook came out quite large for me. liked the pattern. will use a smaller hook. my finished sole was 3 1/2 inches. thanks! Thank you so much for sharing. :) Rnd 2: Work 2 sc into the first sc from previous round. Work 2 sc into the next stitch. Sc 7. Work 2 sc into each of the next 6 stitches. Sc 7. Work 2 into the next two stitches. (34) The last 2 in last two should be sc right? I made one last night to match a Hat I made with curliecues and it's so hippie I love it! I used a multicolor natural hippy type yarn and I am in love! Now to finish the other today. My Baby girl is going to be so awesomely dressed ;) Thank you for sharing!! That sounds so cute! I'm glad you enjoyed it! Thanks SO much for this darling pattern! I made the first pair last night, and they are so darling. 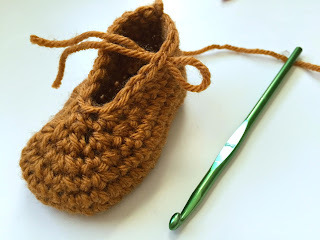 I love crocheting for little ones, but find many bootie patterns difficult. Yours is easy and fast, and the results are amazing. 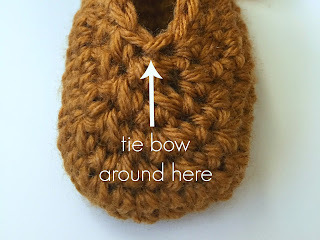 Your little girl's sandal pattern is available on Ravelry; have you thought of posting this one there as well? 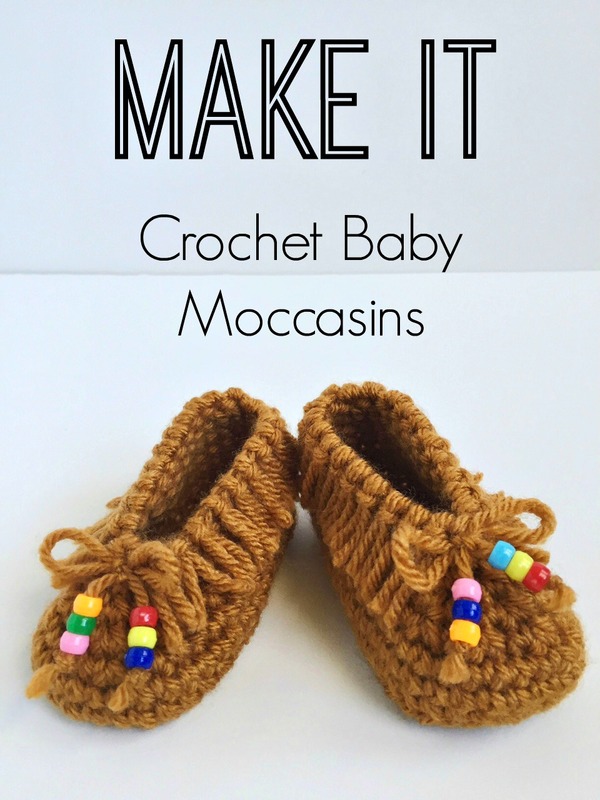 I think hundreds of folks would love to see it there and make these moccasins for a baby girl or boy. Thanks for the suggestion! I am not practiced in using Ravely (someone else posted the sandal pattern for me) but I will sure try and share it on there! Im glad you liked the pattern! Love this pattern. How do you know the size they will fit when using a bigger hook? any help would be appreciated. That's why I put a warning. If you do use the beads please watch the child at all times! Don't put the beads on...it is not worth the choking hazard to the baby or potential toddlers around. You can't watch children 100% of the time, just eliminate the risk. Turn the tags into curlicues or use a contrasting color with knots. I don't know that babies that small are chewing on feet or discerning enough to focus on chewing on or picking up the beads, but by all means if you think they're not appropriate, just leave them off. What does the Hdc? I know the dc means double crochet! what does the H stand for? I've done some crocheting,but never had to use the letter H!! Please Help!! Also need to know what the tog stands for? Is it together? I am having a little trouble with this. After round 6, i did the sc 14, and the sctog went at the toe which is correct. But then the part where it says sc2tog 3 times its not at that toe. Its at the side of the shoe. Ive done every stutch right. Any help? Thanks. I am having same issue. I have tried twice now and the shoe comes out all wonky! HELP!!! I am not sure what I am doing wrong. I was missing that sc in there between the sctog too. If that doesn't line up right for you where it should be, just add a sc somewhere else. It should even out for you without getting too big or out of shape. Is there a pdf copy we can download? Is there a pdf copy where I can download please let me know thank you. I'm also haveing issues on round 7 and on! HELP its not lining up right... I'm guessing cause it went from 40 stitches to 36 I believe... its just not lining up right!! I am an experienced crocheter and there is a flaw in the pattern. Decreases do not line up with center. The round starts two stitches from the center back. If the adjustment isn't made here the decreases will be off by two stitches. I believe this to be the issue. Hopefully this helps. Perhaps the author can edit and adjust. Jill, You may be an experienced crocheter but not an experienced pattern reader. Did you see the 'sc' after the 'sc2tog' in parenthesis ()? The pattern is not flawed. This is a delightful, well written pattern... resulting in a sweet bootie that can be modified, if you wish, and is even a sweeter ballerina shoe when done in pinks. Help. I am making them but my decreases are not ending up looking like yours. This is worked in rds correct? Using a g hook and ww yarn. I used Super Saver & an H hook. Soles were about 4 1/2". Hi... I've been trying to make this pattern for a while and I keep getting stuck on round 3. The pattern says there should be 40 stitches but I've completed the round multiple times and there only ends up being 30. Is it supposed to be 15 sc on each side instead of 10? Not sure what I'm missing..
Great pattern. Made a pair last night with no problem. These moccassins are cute as a button. Thanks for sharing. I would like to make more to sell, if possible. What is your policy on selling the shoes and not the pattern? 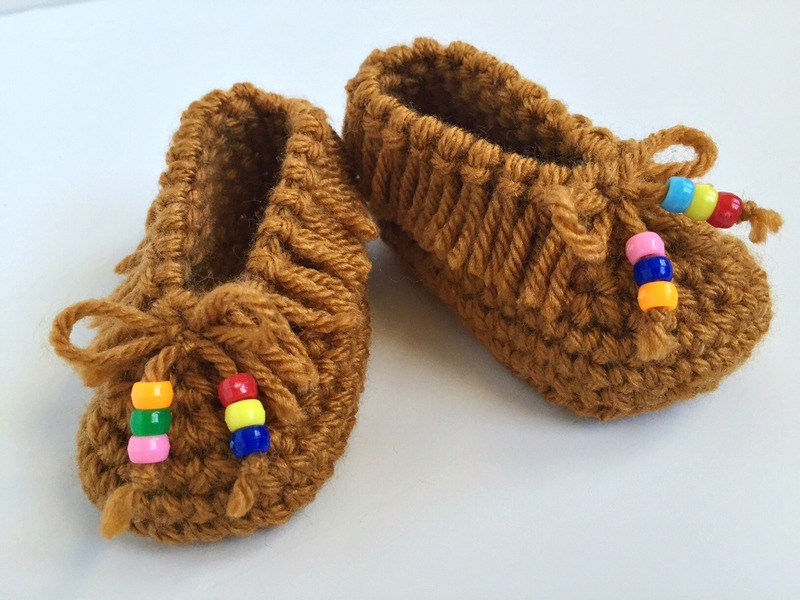 I made this adorable Moccasins for my grandbaby. Can I sale the ones I make? Thank you for designing them.